Stocks on Wall Street ended lower on Friday over renewed concerns about the outlook for interest rates following the Federal Reserve's monetary policy announcement on Thursday. The Fed left interest rates unchanged as widely expected but indicated it remains on track to gradually raise rates despite signs of a slowdown in the pace of growth in business investment. The economic calendar for this week starts off relatively quiet, although reports on consumer prices, retail sales, and industrial production are likely to attract attention. From a technical perspective, the Dow is consolidating unable to break the resistance at 26250. However, the trend is still clearly bullish and buying might accelerate should prices move above that resistance level. 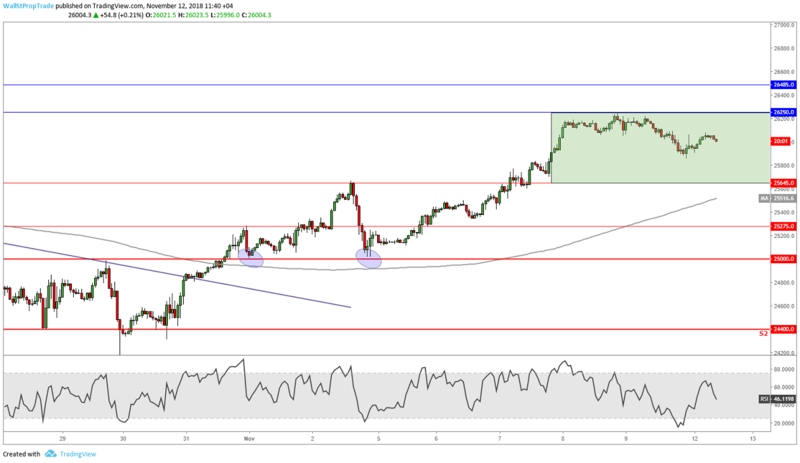 However for today, a bearish pattern is identified confirmed by a bearish RSI on the hourly chart that most likely will push prices lower back to the support at 25645.